This tropical paradise is the home of Alea Joy, florist and owner of the plant shop Solabee Flowers and Botanicals, and her fiancé Peter King. They live in Portland, Oregon, in a typical foursquare house. Alea originally rented her home until the landlord unexpectedly offered to sell it to her. 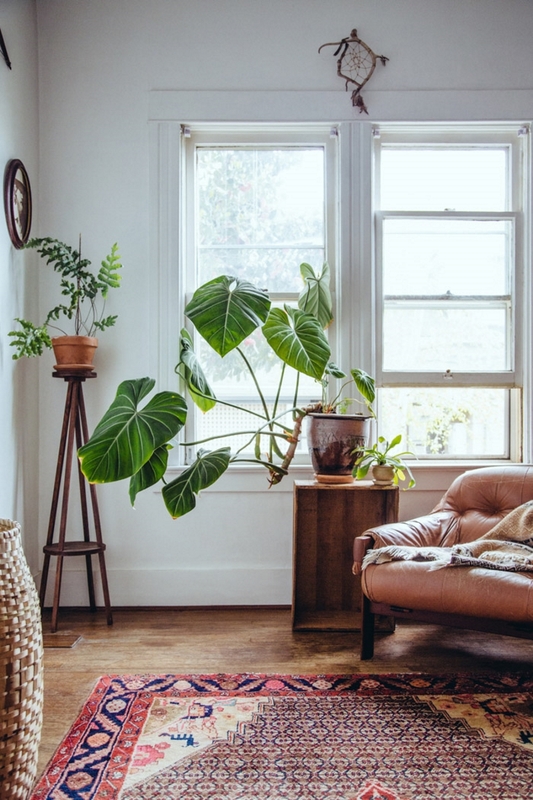 Now she lives there with Peter, their cats Jude and Dancer, and an army of diverse and beautiful potted plants. Much of their decorating has quite a relaxed, earthy feel to it. 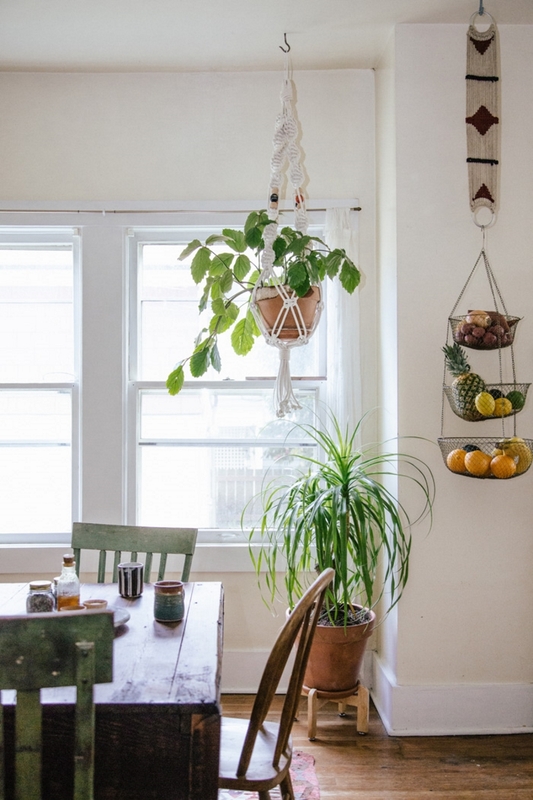 Each room is mainly filled with natural materials: wooden furniture, clay pots, wicker baskets and macramé hanging planters. Elsewhere all these dark browns might make a space feel a bit dingy and dark, but as a backdrop for Alea's personal jungle the colour scheme works perfectly. Instead of using the greenery as a little brightener, she's allowed it to become the focal point of the entire house! In keeping with the down-to-earth vibe, Peter built their dining table and wooden benches by hand. Coming from a family of six it was important to him that they have enough space to squeeze the entire family around the table for dinner, and last year he and Alea hosted thanksgiving for the very first time. I can't vouch for the rest of the furniture but much of it looks like it was handmade, either by Peter or perhaps by someone else. The shelves and benches supporting their many plants are often just slabs of wood nailed together, which makes the entire house feel like something they've created together from scratch. Say hi to Dancer and Jude (below). Jude, the ginger guy, is a rescue cat who turns 12 this year. I've been on a bit of a mission lately to bring more plants into our flat, perhaps because the weather is starting to warm up. Personally I could definitely live here, even with the insane level of upkeep the greenery would need, but I appreciate it's a pretty extreme example. What do you reckon - can you ever have too many plants? Photography by Jaclyn Campanaro for Design Sponge.